UPDATED: Wed., Dec. 13, 2017, 3:43 p.m.
Meghan McCain, a panelist on the program, told Biden on Wednesday she hadn’t been able to get through his new memoir, “Promise Me, Dad,” which centers on the 2015 death of his son, Beau, from an aggressive tumor called glioblastoma. Doctors diagnosed John McCain, an Arizona Republican, with the same type of tumor this past summer. Biden, who served with John McCain in the Senate, stood up and moved from his seat on the set to sit next to her and hold her hand. He told Meghan McCain not to lose hope and that a medical breakthrough is possible. “And it can happen tomorrow,” Biden said, adding that if anyone can beat brain cancer, it’s John McCain. McCain, the Armed Services Committee chairman, has missed several votes in the Senate this week and didn’t attend a White House ceremony held Tuesday for President Donald Trump to sign the annual defense bill into law. The sweeping policy measure has been a major achievement of McCain’s for years. A statement issued late Wednesday by the senator’s office said he’s at the Walter Reed National Military Medical Center in Maryland receiving treatment for the “normal side effects of his ongoing cancer therapy.” He looks forward to returning to work as soon as possible, the statement added. Former Arizona Attorney General Grant Woods, a longtime McCain friend who was his congressional chief of staff in the 1980s, said he talked to McCain this week and he seemed very weak. Now in his sixth Senate term, McCain, 81, underwent surgery in mid-July to remove a 2-inch blood clot in his brain after being diagnosed with glioblastoma. He rebounded quickly, however, returning to Washington and entering the Senate on July 25 to a standing ovation from his colleagues. In a dramatic turn, he cast a deciding vote against the Republican health care bill – a move that drew the wrath of President Donald Trump and conservatives. McCain’s vote scuttled the seven-year effort by the GOP to dismantle much of President Barack Obama’s health care law. 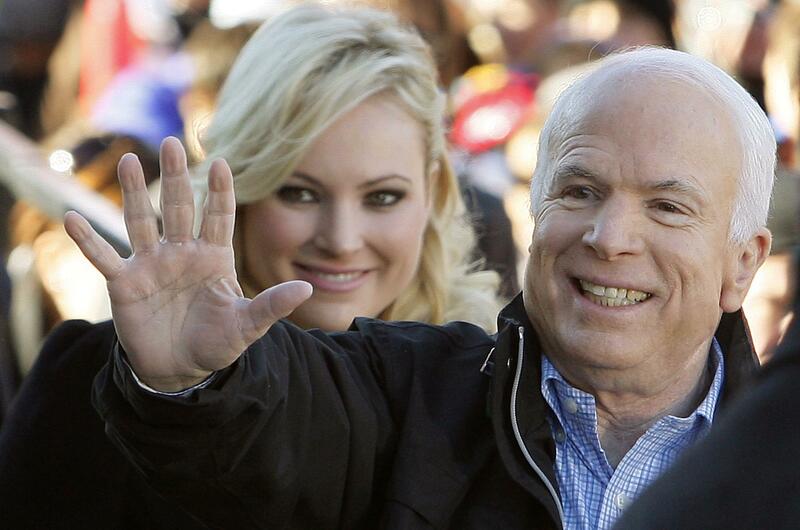 But McCain’s condition has appeared to worsen in recent weeks. He suffered a minor tear in his right Achilles tendon, forcing him to wear a walking brace. McCain eventually began using a wheelchair with members of his staff pushing him where he needed to go. Biden, 74, considered a run for the Oval Office in 2016, but decided against it, later citing the trauma of his son’s death keeping him from the race. During his appearance on “The View,” Biden, a former Democratic senator from Delaware, recounted his long friendship with John McCain and how McCain had befriended Beau many years earlier when he served as a Navy liaison officer to the Senate. Biden also laughed while remembering their political clashes, with the two Senate heavyweights going toe to toe. “Her dad goes after me hammer and tong,” Biden told the audience. But he also said that, even now, if he called John McCain and asked for help, he’d be there for him. “Your strength, hope and fortitude are an inspiration to me and so many others daily,” she wrote. Published: Dec. 13, 2017, 11:01 a.m. Updated: Dec. 13, 2017, 3:43 p.m.